China yesterday denied allegations by Sri Lanka’s coalition Government members that its loans were expensive but reiterated commitment to further bilateral ties as well likelihood of more investments on improved climate. Accounting for over 20% of the country’s outstanding debt, China’s lending for some key infrastructure projects of previous President Mahinda Rajapaksa’s regime came under flack by then Opposition members and the current ruling UNP as being expensive and bloating public debt beyond manageable levels. Allegations included that the Rajapaksa regime cashed-in by inflating cost of infrastructure projects with fat commissions, given readily available financing from China. A visibly concerned Chinese Ambassador Yi Xiangliang during a forum with media yesterday denied criticism on its lending. “Concessional loans were at 2% interest and some commercial loans were at 5%. 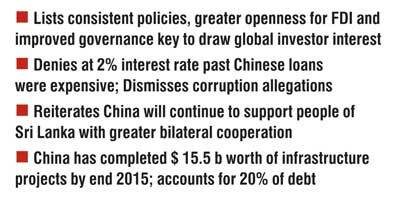 This is the standard applied when China supports developing nations. Such financial support from Beijing is despite Chinese firms having to pay higher for their borrowing,” he said. The Ambassador also found general criticism often to gain political advantage by Ministers as “unfair.” He even went to the extent of saying if interest rates were expensive, why seek more engagement with China. He recalled that there was an instance when Sri Lanka borrowed funds from Europe at 5.8%. It was pointed out that Chinese financing is approved after a thorough and rigorous evaluation in compliance with strict rules and regulations which aim to curb any form of corruption. “If there are allegations of corruption in Chinese funded projects then it is a Sri Lanka issue,” the Ambassador said, while his Commercial Attaché added that despite various allegations, nearly two years on there is no finality or proof. Emphasising that China’s support to Sri Lanka is based on long cherished strong bilateral ties, the Ambassador revealed that China has completed $ 15.5 b worth of infrastructure projects in Sri Lanka by end 2015, covering areas such as transportation, road, ports, water and electricity and ports. Despite flack on China’s role from certain quarters, Xiangliang pointed out that the country remains committed to Sri Lanka. “We pursue bilateral cooperation irrespective of party in power as our affinity is with the people of Sri Lanka,” he said. “Politics shouldn’t destroy economic cooperation or its benefits to the people,” he added. Xiangliang also said that the spate of bilateral visits, including one from President Maithripala Sirisena and two by Prime Minister Ranil Wickremesinghe to China and Beijing’s Foreign Minister to Sri Lanka have further strengthened ties and the resolve to forge ahead with greater cooperation. “I am happy with the progress of our ties and working with the current Government though there is potential to achieve more,” said the Ambassador who assumed office in February last year. He said that China was pleased with the resumption of the $ 1.4 b Port City project, Sri Lanka’s single biggest FDI after the one and half year suspension costing $ 140 m for the promoter - China Harbour. China is looking forward to the establishment of the Colombo International Financial Centre in the Port City and the newly proposed Hambantota Industrial Zone adjacent to the port. 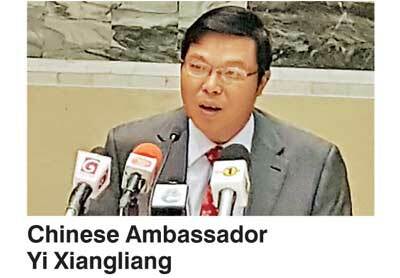 These initiatives, Xiangliang emphasised will, “Contribute to the economic development and prosperity of Sri Lanka. Noting that direct FDI in to Sri Lanka has been around $ 400 m to date and growing, the Ambassador said that in tandem with improved conditions, Chinese companies are willing to invest over $ 5 b in the next five years. However, he listed consistent policies, improved governance and delivery and greater openness among Sri Lankans as FDIs will accelerate inflow of Chinese investments. Last year, outward Chinese investments were $ 138 b and in the first nine months of 2016 the figure has swelled to $ 140 b. “If Sri Lanka can attract 1% of that, it means a significant $ 1.4 billion,” the Ambassador added.